In our recent Integrated Commercial Strategy (ICS) webinar on Sales Enablement, we covered some information that really resonated with attendees. It’s a subtle change in perspective that makes a tremendous difference in how effectively commercial teams are able to focus on boosting sales and fighting margin compression. 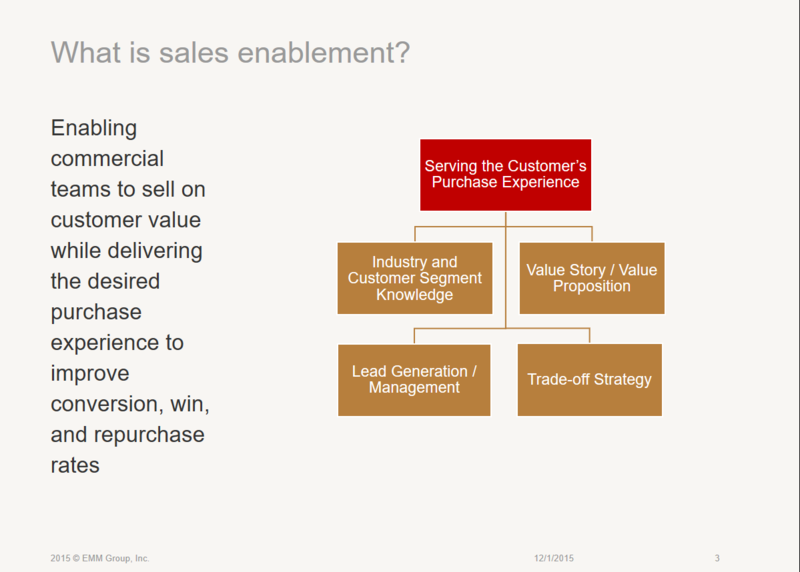 We encourage you to check out the full Sales Enablement webinar when you can, but here we wanted to highlight the opening section where we discussed the fact that effective sales enablement actually involves serving the customer’s purchase experience and needs as opposed to serving the needs of the sales team. But, in reality, effective sales enablement has to do with serving the customer’s purchase experience and needs. So it requires looking at the process from the customer’s point of view. What makes effective sales enablement difficult for most companies? Doing this right isn’t easy as there are plenty of issues that can get in the way. 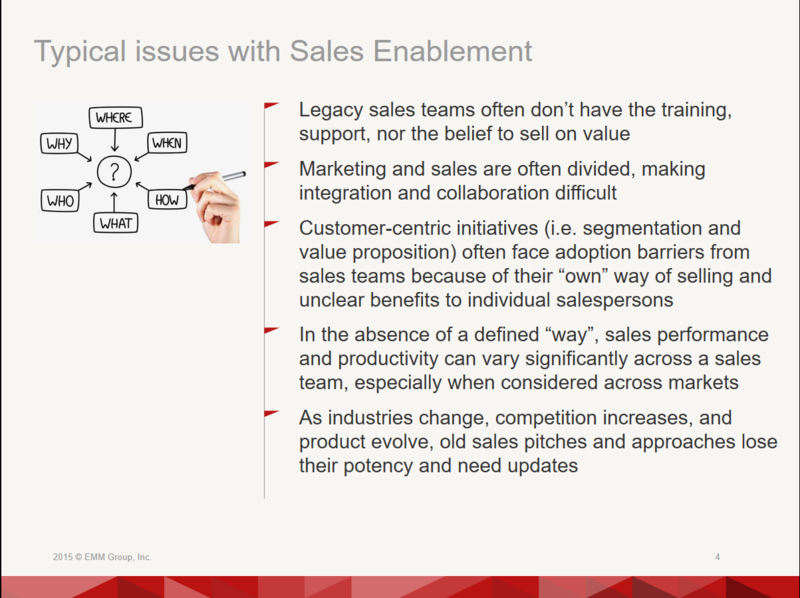 As noted in the slide above, many of the issues in the way of effective sales enablement are internal: a lack of the proper perspective, a lack of training or support, artificial silos that hinder collaboration, adoption barriers, and the like. However, there are also external issues that make it challenging to enable sales appropriately, such as the speed of change affecting every industry and the proliferation of competitive “me too” product development. How does switching to a customer-centric viewpoint enable sales? Serving the customer purchase experience and needs will require a paradigm shift for most organizations. It will affect their entire framework for prioritizing sales initiatives. Once it’s been effectively adopted, however, the results will be impressive. 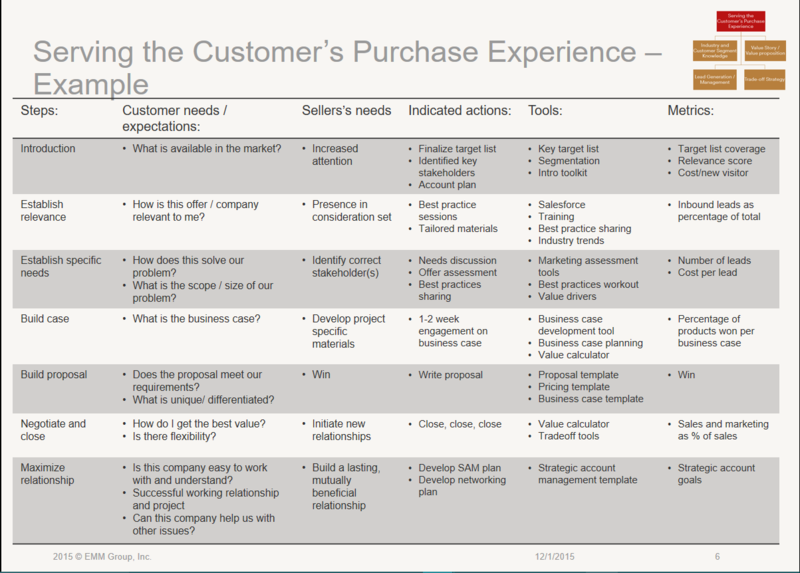 Note the example matrix below and specifically the subtle but important differences between the needs of the sales team and the customer’s needs or expectations. On the right side of the matrix you’ll see actions, tools, and metrics listed for each step of the sales process. As your commercial teams switch from a focus on meeting their own needs to serving the customer’s purchase experience and needs, this is where you’ll make needed changes to the current sales process. We encourage you to fill out a similar matrix for your own company and bring as many different voices from the customer service, marketing, sales, and executive departments to ensure a well-rounded understanding of your needs as well as the customer’s. If you need any guidance or have any questions about this process, contact us and we’ll be happy to help.